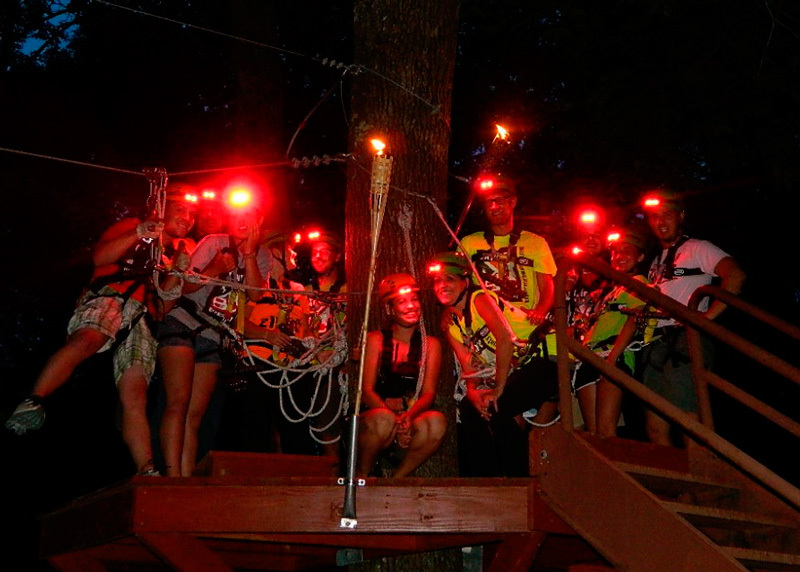 When the sun goes down, headlamps and tiki torches light the way on ziplines in the woods of Brown County, Indiana. Halfway across a bridge suspended near the canopy of the rugged forest of Brown County, Indiana, my knees start to knock. My eyes tell me I’m safely tethered to the cable overhead, but the message doesn’t reach the rest of me as I wobble over a series of slats strung together by rope. Even harder to process: There’s another rope bridge ahead, along with ziplines stretched between platforms, the tallest of which is 60 feet high. And save for flickering tiki torches on each platform and the red-glowing headlamps my teammates and I wear, it’s dark—really dark—out here. “Ready?” asks Mark Washington, a tour guide with eXplore Brown County. He unhooks the carabiners connecting my harness to a safety line and attaches them to the first zipline that will carry me down the wire via a pulley-like trolley. With a starry sky above and the fragrant scent of nearby campfires in the air, I take a breath and launch myself off the platform. For a few brief moments, I’m flying at 45 mph in total darkness. It’s nearly impossible to swallow the yell rising in my throat. So I don’t. And then, just as my nerves start to settle into the experience, it’s over. I hit the stopblock, and a guide—watching my headlamp to gauge my approach—catches me on the next platform, allowing me a few moments to regain my composure (and my ability to stand) before it’s on to the next line. In all, there are five lines in the outing I’ve chosen, the final three taking me over a 3½-acre lake that steals my breath as it sparkles with the light of the moon and stars overhead. Either way, you can count me in for another fly. 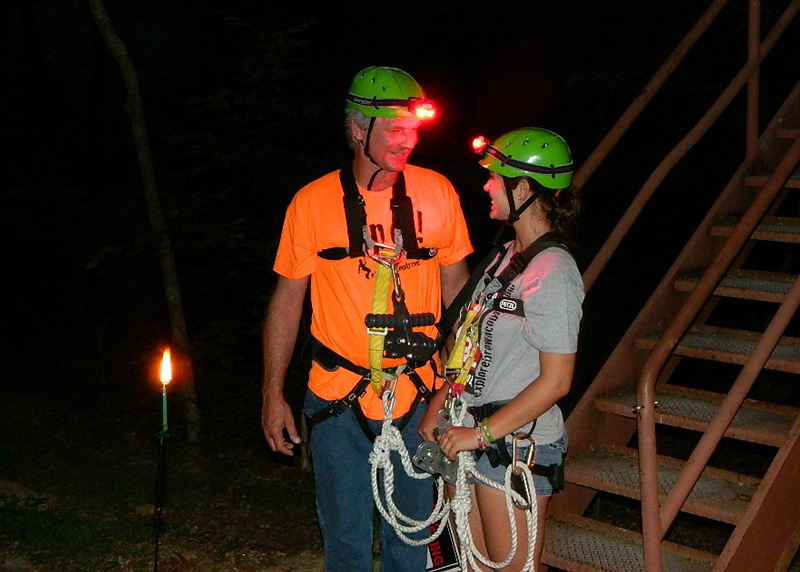 The more challenging of two nighttime options, the three-hour Expedition outing ($80), includes five canopy ziplines. The Escape Tour, also promoted as the Sneak Peak ($45), features three zips that are a bit slower and shorter but just as high. 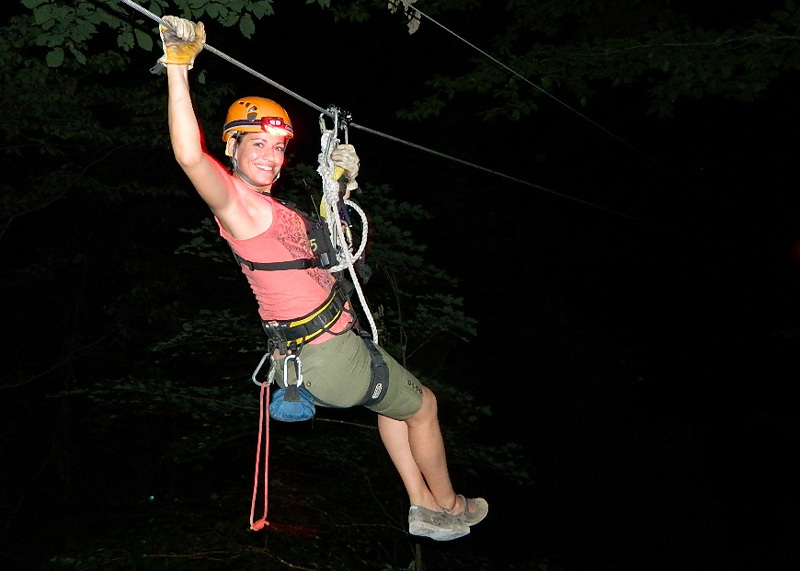 Night Flights with eXplore Brown County run weekends from Memorial Day through October. Daytime tours are also available (explorebrowncounty.com).